Point2 Homes gives you far more than a simple list of houses for sale. Get instant access to a lot of relevant information about Exchange District, Winnipeg, MB real estate, including property descriptions, virtual tours, maps and photos. The search results pages also have a wealth of information on Exchange District, Winnipeg, MB, if you scroll all the way down. 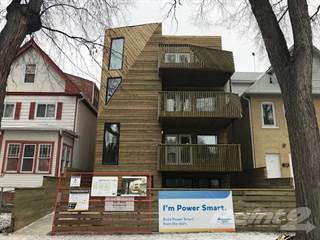 There are 6 houses for sale in Exchange District, Winnipeg, MB. Searching homes for sale in Exchange District, Winnipeg, MB has never been more convenient. 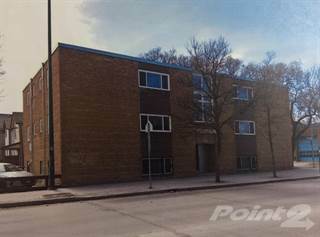 With Point2 Homes, you can easily browse through Exchange District, Winnipeg, MB single family homes for sale, townhomes, condos and commercial properties, and quickly get a general perspective of the real estate prices. Also, you’ll never miss a bargain if you filter listings based on house price drops in the past six months. 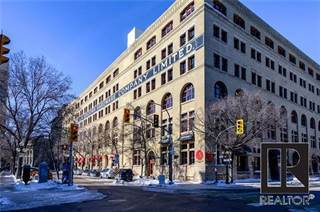 Use the map view to find Exchange District, Winnipeg, MB homes and apartments for sale, based on amenities or city features that you may want close by. You can close in on a specific neighbourhood or area by simply drawing around them with the polygon or radius tools. Stay informed about the latest entries on the real estate market by saving your searches. This way, you get new listings in your inbox, daily or every week, based on your preferences. If you’d like to get in touch with a professional, agents are displayed next to their listings, and they’re easy to contact through the online forms. If you want more options, you can click the Tools tab and Find an Agent, and you’ll get a list of helpful and knowledgeable real estate agents in Exchange District, Winnipeg, MB. Visit the Point2 Homes blog and you can find up to date expert advice on many markets throughout Canada, regular market reports, neighbourhood scoops in cities throughout the provinces, real estate deals and useful recommendations. The Exchange District of Winnipeg, Manitoba provides a unique combination of old and new, with renovated heritage buildings, eclectic local shops and restaurants, and interesting sights, sounds, and smells at every turn. Festivals and events throughout the year, such as the Winnipeg International Jazz Festival and the Fringe Festival, provide lively entertainment and bring thousands of people to the neighbourhood. With so much going on at any given time, the Exchange District offers a special urban experience that encourages residents to try new things and to embrace everything the area has to offer. The Exchange District is a 20-block neighbourhood in the heart of Winnipeg that can be divided into two distinct areas. The West Exchange reaches from Adelaide Street in the west to Main Street in the east, and from Ross Avenue in the north to Notre Dame Avenue in the south. The East Exchange reaches from Main Street in the west to Waterfront Drive in the east, and from the Disraeli Bridge in the north to William Stephenson Way in the south. The Exchange District is a National Historic Site and has about 150 heritage buildings that have been converted to residential and commercial spaces. This neighbourhood is a hub of activity, with local shops and restaurants offering something for every taste and interest. 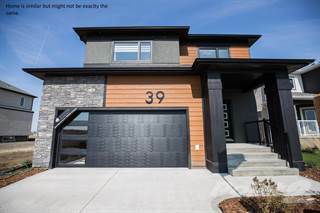 Professionals and families find the activities and convenience of the area to be a definite draw, and the neighbourhood continues to grow in population and popularity. There is always something happening in the Exchange District, with a number of festivals and events held year-round. The Fringe Festival is held annually in July and offers attendees a variety of unique alternative theatre shows by independent companies from around the world. The festival attracts tens of thousands of people each year and shows are held at dozens of venues. Part of the Exchange District is blocked off from vehicle traffic during the 12-day festival to allow performers, vendors, and attendees unrestricted access to roadways. Another important festival held in the Exchange District each year is the Winnipeg International Jazz Festival, which brings together a number of local, national, and international jazz artists. The event, normally held in June, takes place at the historic Old Market Square and a number of other venues in Downtown Winnipeg. There are many restaurants and pubs in the area, including the Peasant Cookery, a French restaurant on Bannatyne Avenue (east of Main Street) with tapas-style options in a rustic-meets-industrial atmosphere. Another take on tapas-style dining in a warm atmosphere can be found at Hermanos, a South American restaurant on Bannatyne Avenue (west of Main Street) that offers relaxing live music while you dine. Hipster-friendly Deer + Almond on Princess Street serves up some interesting dishes and is also known for RAW/almond, a three-week pop-up outdoor restaurant that offers a unique dining experience in Winnipeg’s icy winter. The King’s Head Pub and Eatery on King Street is a staple of the area, offering live music and hearty British/Indian pub grub. Carnaval Brazilian BBQ on Waterfront Drive offers an exciting dining experience, with teams of carvers coming to each table and slicing off pieces of barbequed lamb, beef, pork, chicken, and Brazilian sausage, served with breads and cheeses. 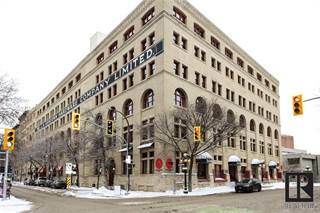 The Exchange District area of Winnipeg is becoming an in-demand neighbourhood for young professionals and those looking for an exciting urban environment in which to live, work and play. With heritage buildings being converted into high-end condos, and brand new buildings appearing on Waterfront Drive, there are spaces to meet a variety of needs. 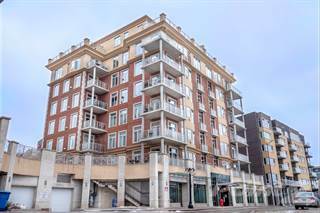 The average listing price for condos in the area is slightly higher than the average price for condos in Winnipeg, but many buyers are happy to pay a bit more for the luxury and location offered by Exchange District condos. The Exchange District is a small neighbourhood, with only 440 people living here in 2006, but the population has grown in the past 10 years, and the growth isn’t looking like it will slow down anytime soon, as new housing options are being offered. Among the adults here, 45.8% are married while 54.2% are single. The majority of housing is condos/ apartments with five or more storeys, most of which were built before 1960 (many of those having been completely renovated). The average annual income is $98,905, and 84.3% of residents are university or college educated. Pollution is not a problem in the Exchange District, but the area buzzes with life from early morning to late evening, so noise can sometimes be an issue. Buses and cars run through the area all day as people commute to work or head to the area for the fantastic restaurants and entertainment options. Main Street runs through the area as well, and is one of the city’s major traffic routes. The Exchange District’s convenience and lively vibe can help make up for a sometimes noisy environment. The crime rate in the Exchange District is surprisingly low considering how near it is to the Downtown area. Only about 1% of the city’s overall crime incidents occur here, and the most common type of crime in the area is commercial breaking and entering. While there are no schools directly within the boundaries of the Exchange District area, there are a number of schools nearby that serve this community. Elementary schools include Dufferin School, Victoria-Albert School, Pinkham School, and École Sacré-Coeur School (French immersion). High school options just outside the Exchange District include The Collegiate at the University of Winnipeg, Hugh John MacDonald School (only grades 7 to 9), Gordon Bell High School, R.B. Russell Vocational High School, Children of the Earth High School, and Argyle Alternative High School. Adults can attend Red River College’s Roblin Centre campus, The University of Winnipeg, Winnipeg Adult Education Centre, Robertson College, and CDI College. Winnipeg Transit is the primary means of public transportation for residents of Exchange District, as well as nearby communities. Transit buses have routes across neighborhoods depending on where you might be going. If you wish to enjoy touring Exchange District, there are transit routes available that runs through the area of Downtown called the Downtown Spirit and it’s free! This route goes around popular sites like The Forks, MTS Centre, Winnipeg Art Gallery and much more. This area is a hub for public transportation. Main Street offers bus routes to all areas of the city, and many routes run from early in the morning to very late at night. Side streets also offer some bus routes, and most bus stops are only a short walk away. Some of the main routes available include Route 160 to the University of Manitoba, Route 66 to Grant Avenue, Route 60 to Pembina Highway, Route 55 to St. Anne’s Road, Route 47 to Transcona, Route 21 to Portage Avenue, and Route 16 to Selkirk-Osborne. Also available are Downtown Spirit buses, which are free to ride and which provide access to a number of Downtown and Exchange District locations. The Exchange District and the surrounding area offer a variety of activities and events for families. The Manitoba Museum on Main Street offers family friendly exhibits and events on a variety of natural and historical topics. The museum is also home to the planetarium and science museum, which are always a hit with kids of all ages. The Forks Market, a historical meeting place where the Red and Assiniboine rivers come together, is full of food, entertainment, and activities. In the summer, artists and musicians delight crowds indoors and out, and in the winter a skating rink provides some outdoor fun before one heads inside to enjoy hot chocolate and cinnamon buns. The Forks Market is also located near the Manitoba Theatre for Young People, which offers plays and shows specifically for kids, as well as the Children’s Museum, which provides hours of fun exploring hands-on exhibits. Some of the parks in the area include Stephen Juba Park near Waterfront Drive, which has fantastic views of the Red River; McDermot Lane Park on McDermot Avenue, a paved space with trees, benches, and a play structure; and the Chinese Gardens in nearby Chinatown, which have beautiful floral displays in summer, as well as water features and traditional Chinese architecture.